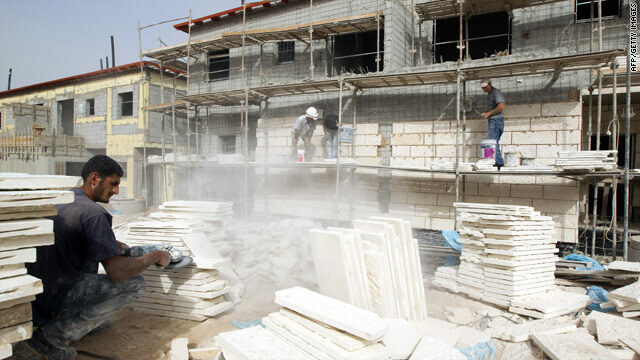 Workers build residential units last month in the Israeli settlement of Ariel, on the West Bank. Palestinian leader Abbas says one Palestinian option is appealing to the U.S. or U.N.
(CNN) -- Palestinian leader Mahmoud Abbas on Thursday renewed his call for an end to Israeli settlement construction in the West Bank as a prerequisite to resume stalled peace talks, and said appealing to the United States or United Nations was among the Palestinian options to end the standoff. In response, Israeli Prime Minister Benjamin Netanyahu reiterated earlier statements that appealing to international organizations wouldn't be in the best interests of the peace effort. and lasting peace between our two peoples, only direct talks." Israel resumed settlement construction in the West Bank in late September after the expiration of a settlement moratorium. Netanhayu has said he would renew the settlement moratorium if Palestinians recognized Israel as a Jewish state -- something Palestinian leaders have refused to do. Abbas, speaking at a news conference Thursday with Egyptian foreign minister Ahmad Abu al-Gheit, said it is premature to appeal to the United States or the U.N. Security Council while efforts to win a new settlement freeze are still under way. But he said such steps are among the options Palestinians are considering in response to the "unacceptable" resumption of settlement activity on land Palestinians consider part of their future state. Alluding to recent warnings to Palestinians by Netanyahu not to take unilateral steps, Abbas characterized Israeli settlement activity as blatantly unilateral actions that have delayed any peace agreement. The Egyptian foreign minister backed Abbas' position, saying Egypt condemns the settlements and supports Abbas' efforts to defend the Palestinians. Some 600 new housing units have begun construction in the West Bank since the freeze expired, according to settlement monitoring group Peace Now. area, seized by Israel during the Six Day War in 1967, is part of what Palestinians want for the capital of their future state.